Scotty Cameron er kjent for å lage gode puttere. Nå kommer nye. Det har blitt mange modeller opp gjennom årene. De har vunnet mange store turneringer. Putterne kommer i mange ulike varianter. Det er to hovedmodeller som koster henholdsvis NOK 3.195 og NOK 3.495. De kommer i pro shopene verden rundt i april. • New Select Newport, Newport 2 and Newport 2.5 models, the next generation of Scotty’s longtime tour favorites, are modern heel-and-toe weighted blades designed to support flowing strokes. Each model features a sole-to-topline 303 stainless steel inlay that is precision mid-milled and hand-buffed to a brilliant, metallic finish, then bonded to the stainless steel body using high-tech vibration dampening material. This fusion of materials provides golfers with responsive feel and feedback at impact. • New Select Newport 2 Notchback – a slightly larger, angular modern blade with a notched flange – features a sole-to-topline 6061 aircraft grade aluminum inlay anodized in gunmetal gray. The lightweight aluminum inlay, bonded to the stainless steel body with vibration dampening material, enhances sound and feel while moving more weight from the stainless steel to the perimeter for improved MOI and stability. 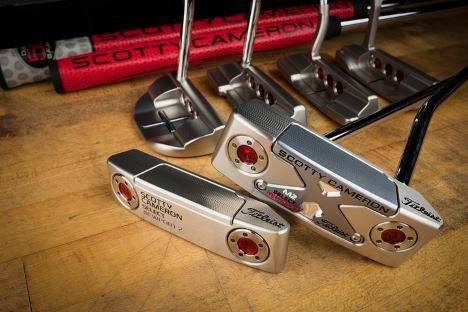 • New Select Newport M1 and Newport M2 mid-mallets combine a 6061 aircraft grade aluminum inlay with Scotty’s face-sole pop-through technology. The face-sole is a single piece of lightweight aluminum that comprises the face inlay, wraps down and around to create the midsection of the sole and pops through the flange to create the sightline field. This construction concentrates weight on the perimeter to produce higher MOI and stability for “straight back/straight through” strokes. The lightweight aluminum face-sole is fine tuned for sound and feel through vibration dampening material attached to the stainless steel core. • MULTI-MATERIAL TECHNOLOGY performance-matched to each putter style. 303 stainless steel inlays are paired with putters designed to support flowing strokes; 6061 aircraft grade aluminum inlays and face-sole construction selected for models designed for higher MOI and “straight-back/straight-through” strokes. • BALANCE AND FORGIVENESS from Select heel-and-toe weighting technology, perfectly matched to shaft length. • ENHANCED ALIGNMENT OPTIONS from milled flange sight lines to crisscross pop-through visual cues. • RESPONSIVE FEEL AND FEEDBACK from integrated vibration dampening system connecting mid-milled face inlays and face-sole components. • TOUR-PROVEN PERFORMANCE and feedback from player-preferred soft, supple Red Matador Midsize grip. • MODERN AESTHETICS from sole-to-topline inlays and face-sole pop-through technology to misted finishes and refined colors and graphics .